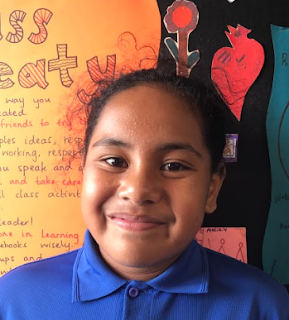 Hi my name is Tupou and I am in room 10 at Ruapotaka Primary school. I am 9 years old and I am the oldest granchild in my family. I feel happy to be back at school because I didn't do much at home during the summer holiday. I am enjoying swimming right now because we are learning new skills that will help us be confident swimmers in beaches, pools and other swimming places. I like maths because I learn how to use different strategies to solve one problem and when I get the answer right it makes me proud. I am excited for the rest of the year! Hey Tupou, take your time to understand the maths questions and use the strategies that you know. Keep up the good work in maths!